In 1974, the Colorado River Basin Salinity Control Act was passed into law. This law was enacted to address concerns regarding the salinity content of the Colorado River. The law authorized various construction projects in selected areas or "units" of the Colorado River Basin intended to reduce the salinity load in the Colorado River. One such area was the Grand Valley Salinity Control Unit in western Colorado. The U. S. Geological Survey has done extensive studies and research in the Grand Valley Salinity Control Unit that provide information to aid the U.S. Bureau of Reclamation and the Natural Resources Conservation Service in determining where salinity-control work may provide the best results, and to what extent salinity-control work was effective in reducing salinity concentrations and loads in the Colorado River. Previous studies have indicated that salinity concentrations and loads have been decreasing downstream from the Grand Valley Salinity Control Unit, and that the decreases are likely the result of salinity control work in these areas. Several of these reports; however, also document decreasing salinity loads upstream from the Grand Valley Salinity Control Unit. This finding was important because only a small amount of salinity-control work was being done in areas upstream from the Grand Valley Salinity Control Unit at the time the findings were reported (late 1990’s). As a result of those previous findings, the U.S. Bureau of Reclamation entered into a cooperative agreement with the U.S. Geological Survey to investigate salinity trends in selected areas bracketing the Grand Valley Salinity Control Unit and regions upstream from the Grand Valley Salinity Control Unit. The results of the study indicate that salinity loads were decreasing upstream from the Grand Valley Salinity Control Unit from 1986 through 2003, but the rates of decrease have slowed during the last 10 years. The average rate of decrease in salinity load upstream from the Grand Valley Salinity Control Unit was 10,700 tons/year. This accounts for approximately 27 percent of the decrease observed downstream from the Grand Valley Salinity Control Unit. Salinity loads were decreasing at the fastest rate (6,950 tons/year) in Region 4, which drains an area between the Colorado River at Cameo, Colorado (station CAMEO) and Colorado River above Glenwood Springs, Colorado (station GLEN) streamflow-gaging stations. Trends in salinity concentration and streamflow were tested at station CAMEO to determine if salinity concentration, streamflow, or both are controlling salinity loads upstream from the Grand Valley Salinity Control Unit. Trend tests of individual ion concentrations were included as potential indicators of what sources (based on mineral composition) may be controlling trends in the upper Colorado. No significant trend was detected for streamflow from 1986 to 2003 at station CAMEO; however, a significant downward trend was detected for salinity concentration. The trend slope indicates that salinity concentration is decreasing at a median rate of about 3.54 milligrams per liter per year. Five major ions (calcium, magnesium, sodium, sulfate, and chloride) were tested for trends. The results indicate that processes within source areas with rock and soil types (or other unidentified sources) bearing calcium, sodium, and sulfate had the largest effect on the downward trend in salinity load upstream from station CAMEO. Downward trends in salinity load resulting from ground-water sources and/or land-use change were thought to be possible reasons for the observed decreases in salinity loads; however, the cause or causes of the decreasing salinity loads are not fully understood. A reduction in the amount of ground-water percolation from Region 4 (resulting from work done through Federal irrigation system improvement programs as well as privately funded irrigation system improvements) has helped reduce annual salinity load from Region 4 by approximately 7,400 tons. This amount is equal to about 5.9 percent of the total decrease (125,000 tons, or about 6,950 tons/year) estimated to have occurred in Region 4 during water years 1986 through 2003. A geographic information system was used to quantify the change in the amount of irrigated land upstream from the Grand Valley Salinity Control Unit from 1993 through 2000. These data indicated that the amount of irrigated land did not change substantially, thus indicating that the downward trends in salinity load did not result from land-use change. 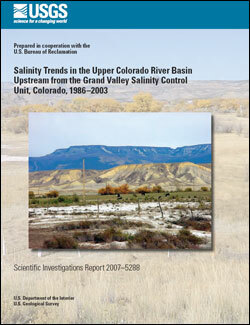 Leib, K.J., and Bauch, N.J., 2008, Salinity trends in the upper Colorado river Basin Upstream from the Grand Valley Salinity Control Unit, Colorado, 1986–2003: U.S. Geological Survey Scientific Investigations Report 2007–5288, 21 p.